This article is about the austerity programme in the 21st century. For austerity during the years immediately following World War II, see Social history of the United Kingdom (1945–present) § Age of Austerity. The United Kingdom government austerity programme is a fiscal policy adopted in the early 21st century following the Great Recession. It is a deficit reduction programme consisting of sustained reductions in public spending and tax rises, intended to reduce the government budget deficit and the role of the welfare state in the United Kingdom. The National Health Service and education have been "ringfenced" and protected from direct spending cuts, but between 2010 and 2019 more than £30 billion in spending reductions have been made to welfare payments, housing subsidies and social services. The effects of United Kingdom austerity policies have proved controversial and the policies have received criticism from a variety of politicians and economists. Anti-austerity movements have been formed among citizens more generally. A UK government budget surplus in 2001–2 was followed by many years of budget deficit and after the financial crisis of 2007–2008 a period of economic recession began in the country. The first austerity measures were introduced in late 2008. In 2009, the term age of austerity, which had previously been used to describe the years immediately following World War II, was popularised by Conservative Party leader David Cameron. In his keynote speech to the Conservative Party forum in Cheltenham on 26 April 2009 he declared that "the age of irresponsibility is giving way to the age of austerity" and committed to end years of what he characterised as excessive government spending. Conservative Party leaders also promoted the idea of budget cuts bringing about the Big Society, a political ideology involving reduced government, with grass-roots organizations, charities and private companies delivering public services more efficiently. The austerity programme was initiated in 2010 by the Conservative and Liberal Democrat coalition government. In his June 2010 budget speech, the Chancellor George Osborne identified two goals. The first was that the structural current budget deficit would be eliminated to "achieve [a] cyclically-adjusted current balance by the end of the rolling, five-year forecast period". The second was that national debt as a percentage of GDP would be falling. The government intended to achieve both of its goals through substantial reductions in public expenditure. This was to be achieved by a combination of public spending reductions and tax increases amounting to £110 billion. The end of the forecast period was 2015–16. Between 2010 and 2013, the Coalition government said that it had reduced public spending by £14.3 billion compared with 2009–10. Growth remained low during this period, while unemployment rose. In a speech in 2013, David Cameron indicated that his government had no intention of increasing public spending once the structural deficit had been eliminated and proposed that the public spending reduction be made permanent. In 2014, the Treasury extended the proposed austerity period until at least 2018. By 2015, the deficit, as a percentage of GDP, had been reduced to half of what it was in 2010, and the sale of government assets (mostly the shares of banks nationalised in the 2000s) had resulted in government debt as a proportion of GDP falling. By 2016, the Chancellor was aiming to deliver a budget surplus by 2020, but following the result of the United Kingdom European Union membership referendum, 2016, he expressed the opinion that this goal was no longer achievable. Osborne's successor as Chancellor, Philip Hammond, retained the aim of a balanced budget but abandoned plans to eliminate the deficit by 2020. In Hammond's first Autumn statement in 2016, there was no mention of austerity, and some commentators concluded that the austerity programme had ended. However, in February 2017, Hammond proposed departmental budget reductions of up to 6% for the year 2019–20, and Hammond's 2017 budget continued government policies of freezing working-age benefits. Following the 2017 snap general election, Hammond confirmed in a speech at Mansion House that the austerity programme would be continued and Michael Fallon, the Secretary of State for Defence, commented: "we all understand that austerity is never over until we've cleared the deficit". Government spending reductions planned for the period 2017–2020 are consistent with some departments, such as the Department for Work and Pensions and the Ministry of Justice, experiencing funding reductions of approximately 40% in real terms over the decade 2010–2020. During 2017 an overall budget surplus on day-to-day spending was achieved for the first time since 2001. This fulfilled one of the fiscal targets set by George Osborne in 2010, which he had hoped to achieve in 2015. In 2018 the Office for Budget Responsibility (OBR) predicted that in 2018–19 public sector debt would fall as a share of national income for the first time since 2001–02, while tax revenues would exceed public spending. Hammond's 2018 Spring Statement suggested that austerity measures could be reduced in the Autumn Budget of that year. However, according to the Resolution Foundation and the Institute for Fiscal Studies (IFS), the OBR's forecasts for borrowing and debt were based on the assumption that the government continued with the planned spending reductions that were announced after the 2015 general election. By 2018 only 25% of the proposed reductions in welfare spending had been implemented. The Resolution Foundation calculated that the proposed reduction in spending on working-age benefits amounted to £2.5 billion in 2018–19 and £2.7 billion in 2019–20, with the households most affected being the poorest 20%. The IFS calculated that the OBR's figures would require spending on public services per person in real terms to be 2% lower in 2022–23 than in 2019–20. The deficit in the first quarter of the 2018–19 financial year was lower than at any time since 2007 and by August 2018 it had reached the lowest level since 2002–3. Hammond's aim at this time was to eliminate the deficit entirely by the mid-2020s. At the Conservative Party conference in October 2018 Prime Minister Theresa May indicated her intention to end the austerity programme following Brexit in 2019 and opposition leader Jeremy Corbyn said that austerity could not be ended without significant increases in public spending. The IFS calculated that funding an end to austerity would require an additional £19 billion per year raised through higher government borrowing or tax increases. Hammond's preference was to reduce the national debt with more years of austerity but in the October 2018 budget he agreed to defer the target date for eliminating the deficit, abandoning plans to achieve a surplus in 2022–23 to allow an increase in health spending and tax cuts. The Resolution Foundation described the step as a "significant easing of austerity". Hammond said that the "era of austerity is finally coming to an end" but that there would be no "real terms" increase in public spending apart from on the NHS. The austerity programme included reductions in welfare spending, the cancellation of school building programs, reductions in local government funding, and an increase in VAT. Spending on the police, courts and prisons was also reduced. A number of quangos were abolished, merged or reduced as a result of the 2010 UK quango reforms. Between 1998 and 2012 the number of children living in "relative poverty" in the UK had fallen by approximately 800,000 to a total of around 3.5 million. Following the introduction of the Welfare Reform Act 2012 the number of children in "relative poverty" increased, with the total by 2019 around 600,000 higher than it had been in 2012. During those seven years the number of children obtaining food from the food banks of The Trussell Trust more than tripled. A number of independent reports have considered the demographic effects of the austerity programme. In 2011, activist collective Feminist Fightback described its gendered impact and in 2012 the Fawcett Society published a report which was critical of the Treasury for not assessing the impact of austerity on women's equality. A 2015 report by the Resolution Foundation identified age-related disparities in the effects of austerity changes. The report projected that during the 2010s transfers to local authorities would fall by 64% and that spending on working-age welfare would fall by 71%, while between 1997 and 2020 spending on older people and health would rise from 33.8% to 43.4% of total government spending. In the same year a group of political scientists at the University of Nottingham found that the impact of austerity on in-work benefits and housing policy had been harmful to working families with children, while wealthy pensioners and older homeowners had benefited. In 2016 research from the Women's Budget Group and the Runnymede Trust indicated that women, people of colour and in particular women of colour had been affected most by austerity, and that they would continue to be affected disproportionately until 2020. This was due to the fact that black and Asian women were more likely to be employed in the public sector, be in low-paid jobs and insecure work, and experience higher levels of unemployment than other groups. Research published in 2017 by the Joseph Rowntree Foundation identified an increase in child poverty and pensioner poverty compared to the previous year, following significant overall decreases during the previous 20 years. Reductions in benefit support and a shortage of affordable housing were considered to be contributing factors. Researchers have linked budget cuts and sanctions against benefit claimants to increasing use of food banks. In a twelve-month period from 2014 to 2015, over one million people in the United Kingdom had used a food bank, representing a "19% year-on-year increase in food bank use". The use of food banks almost doubled between 2013 and 2017. A study published in the British Medical Journal in 2015 found that each one percentage point increase in the rate of Jobseeker's Allowance claimants sanctioned was associated with a 0.09 percentage point rise in food bank use. Research by The Trussell Trust found that the use of food banks increased more in areas where Universal Credit was introduced. However, the Organisation for Economic Co-operation and Development found that the number of people answering yes to the question "Have there been times in the past 12 months when you did not have enough money to buy food that you or your family needed?" decreased from 9.8% in 2007 to 8.1% in 2012, leading some to say that the rise was due to both more awareness of food banks, and the government allowing Jobcentres to refer people to food banks when they were hungry, in contrast to previous governments. When the coalition government came to power in 2010, capital investment in new affordable homes was cut by 60%, while government-imposed caps on local authority borrowing continued to restrict their ability to raise money to build new homes. Writing in Inside Housing, former housing minister John Healey observed that rate of starting social rented schemes had declined from 40,000 in 2009/10 to less than 1,000 in 2015/16. The number of people sleeping rough on any one night across England had more than doubled between 2010 and 2016 to an estimated 4,134, according to a government street count. The benefit cap, introduced via the Welfare Reform Act 2012, set a maximum level for the amount of state welfare benefits that could be paid to an individual household in any one year. The measure came into effect in 2013 with the figure initially set at £26,000 per year, close to the average income of a family in the UK at that time. The anticipated reduction in government expenditure as a result of the measure was £225 million by April 2015. The benefit cap initially affected approximately 12,000 households, mainly in high-rent areas of the UK such as London, but in 2016/17 the limit was reduced to £20,000 per annum (£23,000 in London) extending its effects to around 116,000 households across the UK. A Local Housing Allowance (LHA) policy restricting Housing Benefit for private sector tenants to cover a maximum number of rooms had been in place since 2008. It was extended in April 2013 to cover public housing in the United Kingdom (except Northern Ireland). The resulting under-occupancy penalty, commonly known as the "bedroom tax", affected an estimated 660,000 working age social housing tenants in the UK, reducing weekly incomes by £12–£22. Almost two thirds of the people affected by the penalty were disabled. The measure reduced the expenditure of the Department for Work and Pensions by approximately £500 million per year. From April 2016 the LHA rates used to calculate maximum housing benefit levels for private sector tenants were frozen for four years. Research by the housing charity Shelter indicated that the proportion of such tenants likely to experience a shortfall in housing benefit was 80%, amounting to 300,000 families. The degree of shortfall depends on dwelling, location and individual circumstances, but Shelter expected that by 2020 the shortfall could in some cases reach hundreds of pounds a month. In April 2017, housing benefit payments were ended for new claims made by people aged 18–21. Research by Heriot-Watt University found that the policy would reduce annual government expenditure by £3.3 million. During the period of austerity, the rate of homelessness rapidly increased. For example, during 2016 the rate of homelessness increased by 16%. By 2018 the number of families living in bed and breakfast accommodation was almost 50,000, and there were many more "hidden homeless" people living on the floors and sofas of friends and acquaintances. An article in The BMJ regarded this as a "neon sign that something is fundamentally wrong" with how society is being run, noting that "homeless women die on average at 43 and homeless men at 47, compared with 77 for the rest of us". The Office for National Statistics estimated that 597 homeless people died in England and Wales in 2017, an increase of 24% since 2012. Research was published in 2018 by Shelter analysing government data. It indicated that all forms of homelessness had increased since 2010 and that the number of households living in temporary accommodation had risen to more than 79,000. By 2017 over 33,000 families living in temporary accommodation were working, a proposition that had increased from 44% in 2013 to 55% in 2017. Shelter attributed this to a combination of higher rents, the freeze on housing benefits and the shortage of social housing. The Local Government Association has identified a decrease in UK Government funding of almost 60 per cent for local authorities in England and Wales between 2010 and 2020. The reduction in central government funding for county councils in England combined with an increasing demand for social care services has caused reductions in expenditure on other services such as public libraries, refuse collection, road maintenance and Sure Start, along with increases to council tax rates and the introduction of additional charges for county council services. Local authority subsidies to bus services were reduced by almost half between 2010 and 2018. Research by the Local Government Chronicle has indicated that between 2010 and 2018 there were more than 220,000 redundancies of local authority employees and nearly £4 billion was spent on redundancy payments, excluding outsourcing contracts. Rob Whiteman of CIPFA commented that "this scale of job losses reflects the intense financial pressure on councils as they now have no option other than to provide the bare minimum statutory provisions". Analysis by the Local Government Association in 2018 identified a decrease in the Revenue Support Grant for local authorities in England from £9,927 million in 2015–16 to £2,284 million for 2019–20, leaving 168 authorities with no grant for 2019–20. UK government plans in 2018 proposed the phasing out of grants to local authorities in England, instead funding English local government through a combination of local business rates and council tax. Research by the University of Cambridge published in 2018 said that the greatest reductions in local authority spending had occurred in impoverished post-industrial cities in the north of England and some poor Inner London boroughs. Over 30 such authorities in England had reduced spending by more than 30% between 2010 and 2017, with seven of them reducing spending by more than 40%. In contrast councils in wealthier areas had made smaller reductions. Councils in England experienced an average spending reduction of 24% compared to 12% in Scotland and 11.5% in Wales, the difference resulting from devolved government in those nations. In 2018 Northamptonshire County Council become insolvent and proposed reducing services to the minimum required by law. Austerity measures were blamed for the insolvency, as was the council's refusal to raise council tax despite the rising costs of providing social services. At the time the National Audit Office said that up to 15 other local authorities were also at risk of insolvency. A survey of council leaders, chief executives and mayors conducted by the New Local Government Network indicated that more than 70% of respondents expected that they would be unable to provide non-statutory services beyond 2023 if funding remained as restricted as it had been since 2010. In early 2019, three quarters of councils said they would have to raise taxes close to the legal maximum in order to cover costs, though many would nevertheless be cutting services. A 2012 article by Martin Knapp published in The BMJ's journal Evidence-Based Mental Health said that mental health problems could be attributed to a person's financial situation. At that time 45% of those who were in debt had mental health problems, compared to 14% of those who were not in debt. In 2010 over 40% of benefit claimants in Britain had "mental and behavioural disorders" recorded as their primary health condition. A 2015 report published by Psychologists for Social Change indicated that austerity had contributed significantly to the incidence and level of depression and other mental health conditions within the population. In 2016, figures analysed by the King's Fund think tank showed that "mental health trusts in England were still having their budgets cut, despite government assurances they would be funded on a par with physical healthcare". The analysis "suggests 40% of the 58 trusts saw budgets cut in 2015–16". A 2016 report authored by the NatCen Social Research for UNISON showed that LGBT people had suffered from a lack of access to mental health services as a result of austerity. In 2017, the Royal Society of Medicine said that government austerity decisions in health and social care were likely to have resulted in 30,000 deaths in England and Wales in 2015. Research by University College London published in BMJ Open in 2017 compared the figures for health and social care funding during the 2000s with that during the period 2010–2014. It found that annual growth in health funding during the 2000s was 3.8%, but after 2010 this dropped to 0.41%. Annual growth in social care funding of 2.2% during the 2000s became an annual decrease of 1.57% after 2010. This coincided with mortality rates decreasing by 0.77% annually during the 2000s but rising by 0.87% annually after 2010. The rate of increase in life expectancy in England nearly halved between 2010 and 2017, according to research by epidemiology professor Michael Marmot. He commented that it was "entirely possible" that austerity was the cause and said: "If we don't spend appropriately on social care, if we don't spend appropriately on health care, the quality of life will get worse for older people and maybe the length of life, too." A paper released by the British Medical Journal in November 2017 estimated that the government austerity programme caused around 120,000 excess deaths since 2010. By 2018 figures from the Office for National Statistics (ONS) were showing a fall in life expectancy for those in poorer socioeconomic groups and those living in deprived areas, while average UK life expectancy had stopped improving. Public Health England was asked to carry out a review of life expectancy trends but government ministers said that the arguments put forward by some academics, that austerity had contributed to the change, could not be proved. ONS figures published in 2018 indicated that the slowdown in general life expectancy increase was one of the highest among a group of 20 of the world's leading economies. Between 2010 and 2019 in England and Wales the number of police officers employed was reduced by approximately 20,000. At the same time the measured incidence of murder and robbery increased to their highest levels since the 2000s. Some police leaders have suggested that the reduction in police numbers is the cause, while other analysts have proposed reductions in spending on youth services and social services as the cause. There are approximately five million public sector workers in the UK. Between 2011 and 2013 there was a two-year pay freeze for all public sector workers earning an annual salary of £21,000 or more, which was expected to reduce public expenditure by £3.3 billion by 2014–15. In subsequent years a public sector pay cap resulted in annual public sector wage increases being effectively capped at 1% for 2013–2016, extended to 2020 in the 2015 budget. Advice was given to ministers by the civil service that the policy would result in a pay cut for many people in real terms and could increase child poverty. By 2015 the number of people employed in the Civil Service had been reduced to the lowest level since World War II and public sector employees made up 17.2% of the total workforce, the smallest proportion since comparable records began in 1999. During the 2017 general election the Conservative Party proposed retaining the cap until 2020, potentially reducing public sector expenditure by £5bn. A Labour Party amendment to the 2017 Queen's Speech proposing the removal of the cap was defeated. A 2017 report commissioned by the Office of Manpower Economics indicated that between 2005 and 2015 median hourly earnings fell by 3% in real terms for public sector workers whose salaries are set on the advice of pay review bodies (around 45% of public sector staff). In September 2017, the Scottish Government announced that it intended to end the public sector pay cap in Scotland from 2018, and shortly afterwards the UK government announced the ending of the cap in England and Wales. By autumn 2017 public sector pay had fallen behind private sector pay for comparable work. Working-age social security payments such as Universal Credit, Child Benefit, Child Tax Credit and Working Tax Credit, Housing Benefit and Jobseeker's Allowance have had their rate of increase reduced by austerity. From 2013 onwards, these payments were limited to a maximum annual increase of 1% instead of being increased annually according to the rate of inflation. The policy of suspending the social security payments of unemployed claimants who were judged not to be adequately seeking work was continued, and the frequency and severity of the sanctions was increased. From 2016 a four-year freeze on all working-age social security payments was introduced. It was anticipated that it would affect 11 million UK families and reduce expenditure by £9 billion, a figure later increased to £13 billion. The Welfare Reform and Work Act 2016 abolished the Work-Related Activity Component of Employment and Support Allowance for new claimants from April 2017. This reduced the weekly social security payments for the disabled people affected by £29.05 a week (at 2017/18 rates). The reduction in government expenditure was initially forecast to be £640 million per annum by 2020/21, though this was later revised to £450 million. Analysis in 2018 by the Resolution Foundation indicated that by April 2019 the freeze in social security payments would have resulted in more than 10 million households experiencing a loss of income in real terms, with the lack of an inflation-related increase in 2019 resulting in the average low-income couple with children losing an additional £210 per year. The analysis also said that the cumulative effect of these social security limitations had been to reduce the value of working-age benefits by more than 6% in real terms. Child Benefit had become worth less than it was in 1999 in real terms, and for a second child it was worth 14% less than when it was introduced in 1979. The value of the State Pension has not been subject to austerity measures, being increased each year since 2011 by a minimum of 2.5% per annum. However, some people have been adversely affected financially in their 60s by the rise in the age at which the State Pension is first paid. The decision to equalise the State Pension ages of men and women was made by the government in 1995. From 2010 the women's State Pension age was steadily raised from 60 with the aim of matching that of men at 65 by 2018. An additional increase to 66 for both sexes is intended to be implemented by 2020. Research by the Institute for Fiscal Studies (IFS) in 2017 found that the household incomes of over one million women aged between 60 and 62 had become £32 a week lower on average, and that poverty rates among that group had risen. The IFS also calculated that the reduction in state expenditure combined with the additional tax income from women continuing to work in their 60s resulted in a net increase in state revenue of £5.1 billion per year. A rise in the State Pension age to 67 for both sexes in 2036 had been proposed by Gordon Brown in the 2000s, followed by a rise to 68 in 2046. By 2014 the date set for the rise to 67 had been brought forward to 2026 and in 2018 the rise to 68 was brought forward to 2037. This last change alone resulted in an anticipated reduction in DWP expenditure of £74bn by 2046–47. Reductions in public expenditure in Northern Ireland have often been described as not as harsh as those for the UK as a whole. This is primarily due to the fact that the UK government has not been able to exert direct control over welfare expenditure in Northern Ireland, because welfare policy is a devolved matter for the Northern Ireland Assembly. On a number of occasions the Assembly has not agreed to cuts in public spending, effectively refusing to make them, despite pressure from the UK government. However, the UK government has sought to recoup the expected savings through a fine on Northern Ireland's block grant, which is calculated according to the Barnett formula, and which fell by 8% in real terms between 2010 and 2015. Research by Oxfam Ireland which was published in 2014 indicated said that austerity measures were affecting Northern Ireland disproportionately due to its being one of the UK's most disadvantaged regions with a high dependence on public spending. In 2017 the Conservative–DUP agreement resulted in an additional £1 billion of public sector funding for Northern Ireland over two years, with the money focused on the health, infrastructure and education budgets. During the early years of the austerity programme, many economists argued that the financial changes of the austerity programme should not be undertaken as extensively and as quickly as was done. Osborne, however, argued that without the implementation of the programme in the way that it was another financial crisis was likely. Most macroeconomists now agree that the austerity programme pursued by the Coalition Government in its first two years was both too severe and unnecessary and set back the economic recovery which was underway in the first half of 2010. The Office of Budget Responsibility confirmed that the austerity programme reduced GDP, while the Oxford economist Simon Wren-Lewis has calculated that the Coalition Government's austerity programme cost the average household £4000 over the lifetime of the Parliament and severely damaged those public services which were not ring-fenced. Instead of focussing on the long-term structural causes of increases in public expenditure, the current government have adopted glib and uninformed targets for reductions in overall expenditure. Rather than tackling a housing crisis or low pay they have introduced measures like the benefit cap and the bedroom tax. Ben Chu, economics editor of The Independent newspaper, commented that: "Austerity, as practiced by Osborne, was essentially a political choice rather than an economic necessity, and the human costs have been huge". Economists Alberto Alesina, Carlo A. Favero and Francesco Giavazzi, writing in Finance & Development in 2018, argued that deficit reduction policies based on spending cuts typically have almost no effect on output, and hence form a better route to achieving a reduction in the debt-to-GDP ratio than raising taxes. The authors commented that the UK government austerity programme had resulted in growth that was higher than the European average and that the UK's economic performance had been much stronger than the International Monetary Fund had predicted. The United Nations carried out an investigation in 2018 led by Philip Alston, the United Nations special rapporteur on extreme poverty and human rights, into the effect of austerity policies in the UK. Alston concluded that the austerity programme had breached UN human rights agreements relating to women, children, disabled people and economic and social rights. Alston's report described the programme as "entrenching high levels of poverty and inflicting unnecessary misery in one of the richest countries in the world". Peter Dominiczak (political editor at The Daily Telegraph) wrote that because spending on the NHS and foreign aid is ring-fenced, "other Whitehall departments will face savage cuts to their budgets". However, some (such as Dr Louise Marshall in The Guardian) have questioned whether the National Health Service (NHS) really is exempt from austerity measures. A YouGov poll in 2015 found that whilst 58% of those surveyed viewed austerity as "necessary", and 48% judged it to be good for economy (compared to 34% who thought it bad for the economy), 50% thought the programme was being carried out "unfairly". An April 2018 opinion poll by Number Cruncher Politics in the Financial Times found that 66% of British adults, including majorities of all major parties' supporters, thought austerity had "gone too far". A poll by Survation for the GMB trade union published in spring 2018 found that 62% of respondents wanted the 2018 spring budget to increase spending on public services in real terms, while 48% of those who had voted for the Conservative Party at the 2017 general election thought that austerity had been excessive. The 2010 UK general election was contested by a Labour Party and a Conservative Party which had both committed themselves to austerity policies. Labour's then-Chancellor of the Exchequer Alistair Darling predicted that "two parliaments of pain" would be necessary to address the UK's budget deficit. The Institute for Fiscal Studies said that Labour's plans implied a cumulative decline of 11.9% in public spending over four years. This would reduce public expenditure by a total of £46 billion in inflation-adjusted terms, taking it from over 27% of the economy to below 21%, back to its level in the late-1990s. The IFS also said that there appeared to be only a modest difference between the plans put forward by the two main political parties. As predicted, neither party won a majority at that year's general election; resulting in the first hung parliament in 36 years, and the Conservative Party forming a coalition government with the centrist Liberal Democrats. At the end of the first full parliament under the austerity programme, the Labour Party and the Conservatives were deadlocked in the polls. At the 2015 UK general election, the Conservative Party modified their commitment to austerity with a series of unfunded spending promises, including £8 billion of additional expenditure for the NHS. At the same time, the 2015 Conservative Party general election manifesto proposed making sufficient reductions in public spending and welfare to eliminate the budget deficit entirely by 2018–19 and run a small budget surplus by 2020. The Labour Party's manifesto proposed the less rigorous objective of reducing the budget deficit every year with the aim of seeing debt as a share of GDP falling by 2020 and achieving a budget surplus "as soon as possible". This would render the spending reductions proposed by the Conservatives unnecessary, according to some analyses. The Conservative Party won the general election with an overall majority for the first time in 23 years, which was unexpected by most polls as they had predicted another hung parliament. Political commentator Patrick Wintour argued that one of the reasons for Labour's loss was its lack of clarity on the cause of the budget deficit. Anti-austerity protests followed the election result, but post-election polling for an independent review conducted by Campaign Company for Labour MP Jon Cruddas indicated that voters in England and Wales did not support an anti-austerity platform, concluding: "the Tories did not win despite austerity, but because of it". The 2017 UK general election was held almost three years earlier than scheduled under the Fixed-term Parliaments Act 2011 in an attempt to increase the Government's majority to facilitate the Brexit process. The Conservative Party manifesto pledged to eliminate the deficit by the "middle of the next decade", an aim which the Institute for Fiscal Studies (IFS) said would "likely require more spending cuts or tax rises even beyond the end of the next parliament". The Labour Party manifesto proposed increasing the Treasury's income by £49 billion per year as a result of taxation rises and increasing public expenditure "to its highest sustained level in more than 30 years". The IFS said that Labour's proposals "could be expected to raise at most £40 billion" and that Labour was planning to maintain a majority of the cuts to working-age benefits proposed by the Conservatives. As a result of the election, the Conservative Party lost their parliamentary majority, but remained in government as the largest single party in parliament. Gavin Barwell, Theresa May's Downing Street Chief of Staff, blamed anger over Brexit and austerity for the loss of seats. The Labour opposition announced a plan to challenge further austerity measures and vote against them in the House of Commons. A Labour spokesman said: "We will be using the changed parliamentary arithmetic to drive home the fact that the Tory programme for five more years of austerity will not go on as before." 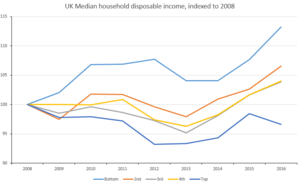 ^ "Household disposable income and inequality in the UK: financial year ending 2016". Office for National Statistics. 10 January 2017. ^ a b c d e f g h Benjamin Mueller (24 February 2019). "What Is Austerity and How Has It Effected British Society?". The New York Times. ^ Krugman, Paul. "The Austerity Delusion". The Guardian. Retrieved 2 May 2016. ^ a b Richard Partington (21 September 2018). "UK government deficit widens unexpectedly in August". The Guardian. ^ a b c d e f Paul Mac Flynn (6 May 2015). "Austerity in Northern Ireland. Where are we and where are we going?". Nevin Economic Research Institute. ^ Kynaston, David (2010). Austerity Britain, 1945-1951. Bloomsbury Publishing. ISBN 978-0-8027-7958-8. ^ "From Austerity to Inequality". NICVA. Retrieved 27 June 2017. ^ Deborah Summers (26 April 2009). "David Cameron warns of 'new age of austerity'". The Guardian. . Archived from the original on 29 April 2009. Retrieved 26 April 2009. ^ M. Nicolas Firzli & Vincent Bazi. "Infrastructure Investments in an Age of Austerity : The Pension and Sovereign Funds Perspective". Revue Analyse Financière, volume 41 (Q4 2011 ed.). Retrieved 30 July 2011. ^ a b c d e Ben Chu (6 July 2017). Austerity: Is it really over?. The Independent. ^ a b Rob Merrick (28 February 2017). "Chancellor Philip Hammond accused of more 'failed austerity' after demanding extra spending cuts before the election". The Independent. ^ Nicholas Watt (12 November 2013). "David Cameron makes leaner state a permanent goal". The Guardian. ^ James Kirkup (5 January 2014). "George Osborne to cut taxes by extending austerity and creating smaller state". Retrieved 1 February 2014. ^ Peter S. Goodman (7 October 2016). "Europe May Finally End Its Painful Embrace of Austerity". New York Times. Retrieved 17 October 2016. ^ Peter Walker; Rowena Mason (3 October 2016). "Philip Hammond to ditch George Osborne's economic targets". The Guardian. Retrieved 18 October 2016. ^ Michael Wilkinson (3 October 2016). "Philip Hammond warns Britain's economy heading for post-Brexit 'rollercoaster' ride as he drops pledge for budget surplus by 2020". The Telegraph. Retrieved 18 October 2016. ^ Will Chalk (24 November 2016). "Whatever happened to austerity?". BBC Newsbeat. Retrieved 28 November 2016. ^ Christopher Hood; Rozana Himaz (27 November 2016). "How does austerity look in retrospect? The UK's recent fiscal squeeze in historical perspective". The London School of Economics and Political Science. Retrieved 28 November 2016. ^ Anoosh Chakelian (8 March 2017). "What welfare changes did Philip Hammond make in his Budget 2017?". New Statesman. ^ George Parker; Gavin Jackson (20 June 2017). "Philip Hammond insists he will stick with austerity". Financial Times. ^ Peter Walker; Anushka Asthana (27 June 2017). "Michael Fallon defends £1bn DUP deal amid backlash". The Guardian. ^ Alan Travis (22 November 2017). "Public services face real-terms spending cuts of up to 40% in decade to 2020". The Guardian. ^ Wallace, Tim (1 March 2018). "Back in black: UK in current budget surplus as IMF says Osborne was right to cut spending". The Telegraph. ISSN 0307-1235. Retrieved 16 June 2018. ^ Gemma Tetlow (14 March 2018). "UK will struggle to ease austerity in coming months, think-tanks warn". Financial Times. Retrieved 15 March 2018. ^ Chris Giles (21 July 2018). "UK deficit at lowest level since before financial crisis". Financial Times. ^ Heather Stewart (3 October 2018). "Theresa May pledges end to austerity in Tory conference speech". The Guardian. ^ Peter Walker (10 October 2018). "Jeremy Corbyn: claim austerity is over is 'big Conservative con'". The Guardian. ^ Kamal Ahmed (16 October 2018). "Hammond's £19bn bill to 'end austerity'". BBC News. ^ Phillip Inman; Larry Elliott (1 October 2018). "Philip Hammond: party must offer solutions to Labour questions". The Guardian. ^ Jim Pickard; George Parker (30 October 2018). "Hammond defends decision to delay balancing books". Financial times. ^ "Budget 2018: Austerity finally coming to an end, says Hammond". BBC News. 29 October 2018. ^ "Hammond v McDonnell on Budget 'end of austerity' claim". BBC News. 30 October 2018. ^ "'Bonfire of the quangos' revealed". Channel 4 News. 14 October 2010. ^ Feminist, Fightack (15 December 2011). "Cuts Are a Feminist Issue". Soundings Journal. Issue 49 (49). Retrieved 17 April 2016. ^ "The Impact of Austerity on Women" (PDF). The Fawcett Society. The Fawcett Society. Retrieved 18 April 2016. ^ David Kingman (23 November 2015). "New research shows austerity is favouring older voters at the expense of the young". The Intergenerational Foundation. ^ Maya Goodfellow (28 November 2016). "A toxic concoction means women of colour are hit hardest by austerity". The Guardian. ^ "A cumulative gender impact assessment of ten years of austerity policies" (PDF). The Women's Budget Group. The Women's Budget Group. Retrieved 18 April 2016. ^ Richard Partington (4 December 2017). "UK government warned over sharp rise in child and pensioner poverty". The Guardian. ^ Butler, Patrick (22 April 2015). "Food bank use tops million mark over the past year". The Guardian. Retrieved 20 May 2017. ^ Loopstra, Rachel (2015). "Austerity, sanctions, and the rise of food banks in the UK" (PDF). BMJ. 350: 2. doi:10.1136/bmj.h1775. PMID 25854525. Archived from the original (PDF) on 26 June 2015. Retrieved 25 June 2015. ^ McKinstry, Leo. "Despite the Left's claims over soaring foodbank use, Britain is not going hungry". Daily Express. Retrieved 11 November 2015. ^ Young, Toby (22 April 2015). "Was food poverty actually higher under the last Labour government?". The Spectator. Retrieved 11 November 2015. ^ "How do you fix a housing crisis in a time of austerity?". The Guardian. 11 March 2015. ^ Greg Mulligan (1 September 2016). "Comment: Time to end housing sector austerity". Mulbury. ^ Natalie Bloomer (13 February 2017). "2017: The year the full effects of austerity are felt". politics.co.uk. ^ "'Thousands' hit by government benefit cap now in work". BBC News. 6 February 2014. ^ Patrick Butler (1 November 2016). "Benefit cap will hit 116,000 of poorest families, say experts". The Guardian. ^ a b S. Moffatt; S. Lawson; R. Patterson; E. Holding; A. Dennison; S. Sowden; J. Brown (15 March 2015). "A qualitative study of the impact of the UK 'bedroom tax'". Journal of Public Health. Oxford University Press. 38 (2): 197–205. doi:10.1093/pubmed/fdv031. PMC 4894481. PMID 25774056. ^ Ryan, Frances (16 July 2013). "'Bedroom tax' puts added burden on disabled people". The Guardian. ^ Wendy Wilson; Richard Keen (19 February 2016). Impact of the under-occupation deduction from Housing Benefit (social housing) (Report). House of Commons Library (Briefing Paper). p. 7. ^ Patrick Butler (10 September 2015). "Low-income families in private housing face large benefit shortfalls". The Guardian. ^ Jon Stone (3 March 2017). "Homelessness expected to rise further as Government scraps housing benefit for young people". The Independent. ^ "Homeless people's deaths 'up 24%' over five years". BBC News. 20 December 2018. ^ Shelter research – In work, but out of a home (PDF) (Report). Shelter. 2018. Retrieved 19 December 2018. ^ LGA briefing: Debate on local government funding, House of Commons, Tuesday 15 January 2019 (Report). Local Government Association. 11 Jan 2019. ^ Patrick Butler (27 June 2018). "English councils warn 'worst is yet to come' on cuts". The Guardian. ^ Gwyn Topham (2 July 2018). "Bus services in 'crisis' as councils cut funding, campaigners warn". The Guardian. ^ Patrick Butler (13 September 2018). "Councils in England spend £4bn on 220,000 redundancies since 2010". The Guardian. ^ May Bulman (1 October 2018). "English councils brace for biggest government cuts since 2010 despite 'unprecedented' budget pressures". Independent. ^ a b Patrick Butler (9 October 2018). "'Territorial injustice' may rise in England due to council cuts". The Guardian. ^ Patrick Butler (1 August 2018). "Northamptonshire forced to pay the price of a reckless half-decade". The Guardian. ^ "Most local authorities will only deliver the bare minimum in five years time". New Local Government Network. 9 August 2018. ^ editor, Patrick Butler Social policy (14 February 2019). "Council tax to rise across England as austerity hits hard" – via www.theguardian.com. ^ Knapp, Martin (2012). "Mental health in an age of austerity" (PDF). Evidence Based Mental Health. 15 (3): 54–55. doi:10.1136/ebmental-2012-100758. PMID 22888109. Retrieved 19 December 2018. ^ Laura McGrath; Vanessa Griffin; Ed Mundy. The Psychological Impact of Austerity: A Briefing Paper (PDF). Psychologists for Social Change (Report). Retrieved 17 March 2018. ^ "Mental health budgets 'still being cut despite pledge'". BBC News. 14 October 2016. Retrieved 21 May 2017. ^ Sinclair, Sarah (25 November 2016). "Austerity measures are harming the LGBT community's mental health". Pink News. Retrieved 26 November 2016. ^ Haroon Siddique (17 February 2017). "Health cuts most likely cause of major rise in mortality, study claims". The Guardian. ^ Hannah Summers (18 February 2017). "Tony Blair's Brexit speech 'not helpful', says Jeremy Corbyn". The Guardian. ^ Alex Matthews-King (15 November 2017). "Landmark study links Tory austerity to 120,000 deaths". The Guardian. Retrieved 16 November 2017. ^ Nick Triggle (18 July 2017). "Life expectancy rises 'grinding to halt' in England". BBC News. ^ Denis Campbell (18 July 2017). "Rise in life expectancy has stalled since 2010, research shows". The Guardian. ^ Andrew Gregory (16 November 2017). "Austerity linked to 120,000 deaths as policy is branded 'economic murder'". Daily Mirror. Retrieved 6 December 2017. ^ Alex Matthews-King (15 November 2017). "Landmark study links Tory Austerity to 120,000 deaths". The Independent. Retrieved 6 December 2017. ^ Danny Dorling; Lucinda Hiam (15 March 2018). "Rise in life expectancy has stalled since 2010, research shows". The Conversation. ^ Alex Therrien (25 September 2018). "Life expectancy progress in UK 'stops for first time'". BBC News. ^ "UK among worst for life expectancy rises". BBC News. 7 August 2018. ^ a b c "Public sector pay cap under review, No 10 suggests". BBC News. 28 June 2017. ^ a b Bailey, David; Shibata, Saori. "UK: Public sector pay". Anti-austerity in Low-Resistance Models of Capitalism. Retrieved 3 July 2017. ^ Chris Mason; Katy Dillon (27 October 2018). "George Osborne kept pay cap despite child poverty warning". BBC. ^ Rajeev Syal (27 October 2018). "George Osborne ignored poverty warnings on 1% pay cap". The Guardian. ^ Sarah O’Connor (25 November 2015). "Public sector austerity drive gathers pace in Autumn Statement". Financial Times. ^ Rowena Mason; Anushka Asthana (3 July 2017). "Damning government report shows depth of public sector pay cuts". The Guardian. ^ "About us". Office of Manpower Economics. Retrieved 5 July 2017. ^ "Sturgeon says Scotland will end public sector pay cap". BBC News. 5 September 2017. ^ "Public sector pay cap to be lifted". BBC News. 12 September 2017. ^ Jamie Doward (21 October 2017). "Austerity puts public workers' wages below private sector". The Observer. ^ a b Heather Stewart; Richard Partington (13 October 2018). "Poorest families to lose out on £210 a year owing to benefits cap". The Guardian. ^ Dorey, Peter; Garnett, Mark (2016). The British Coalition Government, 2010-2015: A Marriage of Inconvenience. Springer. pp. 150–151. ISBN 9781137023773. ^ Ashley Cowburn (1 April 2017). "Spending freeze to cut extra £4bn from benefits as raft of new benefit cuts kick in". The Independent. ^ Abolition of the ESA Work-Related Activity Component (Report). House of Commons Library (Briefing paper). 7 March 2017. ^ Phillip Inman (27 April 2017). "Pensions triple lock: what you need to know". The Guardian. ^ "Older women poorer after pension age change, says IFS". BBC News. 2 August 2017. ^ Andrew Porter; Robert Winnett (6 October 2009). "Pension age to rise within 7 years, say Conservatives". Telegraph. ^ Andrew Oxlade (22 July 2014). "Age 40? No access to pension until 58". Telegraph. ^ Tom Batchelor (19 July 2017). "State pension age: Millions of people will have to work an extra year before retiring at 68". Independent. ^ Vincent Boland (2 March 2015). "Northern Ireland braces for austerity". Financial Times. ^ "Austerity creating 'more unequal NI society'". BBC News. 15 January 2014. ^ Gamble, Andrew (3 September 2015). "The Economy". Parliamentary Affairs. Oxford University Press and Hansard Society. 68: 154–167. doi:10.1093/pa/gsv033. ^ Ha-Joon Chang (1 June 2017). "The myths about money that British voters should reject". The Guardian. ^ Alesina, Alberto; Favero, Carlo A.; Giavazzi, Francesco (March 2018). "Climbing Out of Debt". Finance & Development. International Monetary Fund. 55 (1). ^ Robert Booth (28 June 2018). "UN to investigate Tory record on poverty and human rights". The Guardian. ^ Robert Booth; Patrick Butler (16 November 2018). "UK austerity has inflicted 'great misery' on citizens, UN says". The Guardian. ^ Peter Dominiczak (21 July 2015). "George Osborne to demand £20billion of Whitehall cuts". ^ Marshall, Dr Louise (3 December 2012). "Should we start preparing for a decade of austerity in the NHS?". The Guardian. Guardian News and Media. Retrieved 12 November 2015. ^ a b Stanley, Liam (9 July 2015). "What six public opinion graphs tell us about austerity". Sheffield Political Economy Research Institute. Retrieved 16 June 2018. ^ Faiza Shaheen (13 March 2018). "Philip Hammond is trying to hide the pain of austerity. Don't fall for it". The Guardian. ^ Elliott, Larry (25 March 2010). "Alistair Darling: we will cut deeper than Margaret Thatcher". The Guardian. ^ George Parker (14 April 2015). "Tories break with austerity and promise 'good life' to voters". Financial Times. ^ Matthew Holehouse (5 May 2015). "Labour manifesto 2015: the key policies and what they mean for you". The Telegraph. ^ a b James Tapper (9 May 2015). "Anti-austerity protesters take to UK streets after Tory election victory". The Guardian. ^ Wintour, Patrick (3 June 2015). "The undoing of Ed Miliband – and how Labour lost the election". The Guardian. Retrieved 16 June 2018. ^ Patrick Wintour (4 August 2015). "Anti-austerity unpopular with voters, finds inquiry into Labour's election loss". The Guardian. ^ "Reality check: How big is the UK's deficit and debt?". BBC News. 17 May 2017. ^ Edward Malnick (26 May 2017). "Tory plan to balance budget by mid-2020s 'could require tax rises'". The Daily Telegraph. ^ "Theresa May's chief of staff Gavin Barwell: Austerity and Brexit cost us". BBC News. 12 June 2017. ^ Heather Stewart (10 June 2017). "Theresa May adopts contrite tone after Tory MPs vent anger over election". The Guardian.